Two heavy-lift barge cranes are working on a submerged object just off the main construction hall’s launching ramp. While the nature of the object is unclear, what is visible suggests a sunk mother ship or small submarine. While there is growing concern that the North may be planning a submarine-launched ballistic missile (SLBM) test in the near future, the current imagery does not indicate an imminent test. 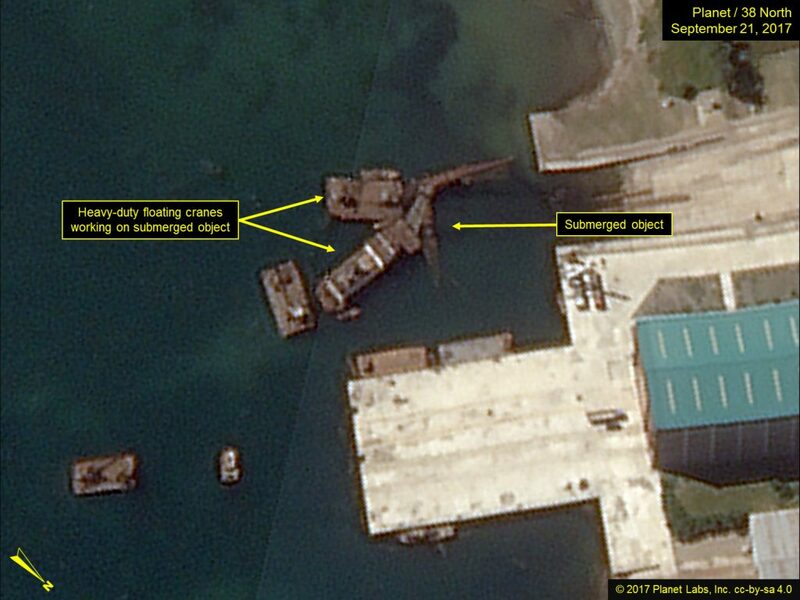 The SINPO-class submarine, submersible test stand barge and nearby test stand, however, appear capable of supporting a test at any time of Pyongyang’s choosing. Figure 1. 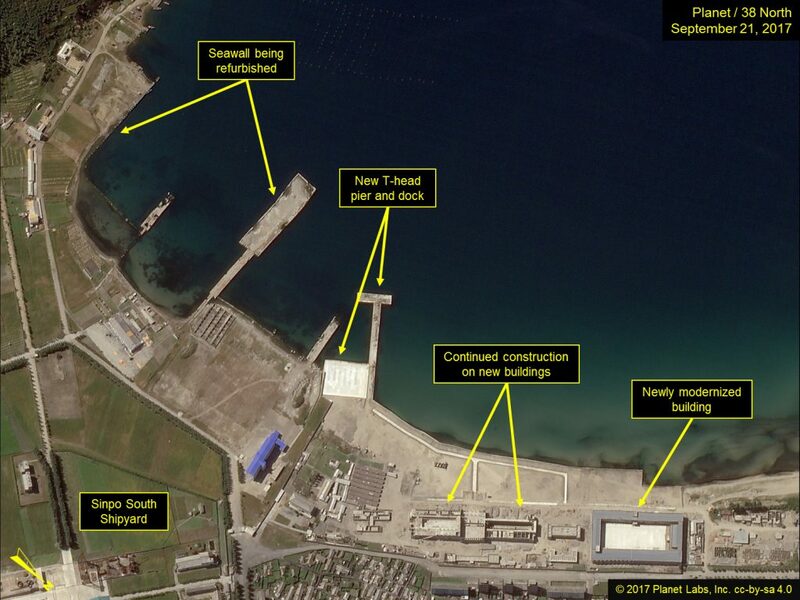 Overview of Sinpo South Shipyard. The netting suspended over the SINPO-class submarine (SSBA) observed last month is no longer present, indicating that whatever work was being conducted on the vessel has been completed. The nature of such work is, however, unknown. Both the submarine and submersible missile test stand barge remain berthed at the same positions in the secure boast basin as noted in our August 7 report, suggesting, without offering real proof, that they have not left port. No activity is observed on the dock adjacent to the submarine or test stand barge, none of the commonly seen support vessels are present in the boat basin and the floating security barrier remains present at the entrance to the boat basin. This relatively tranquil scene notwithstanding, both the submarine and test stand barge could be put to sea to conduct new SLBM tests at relatively short notice. Figure 2. 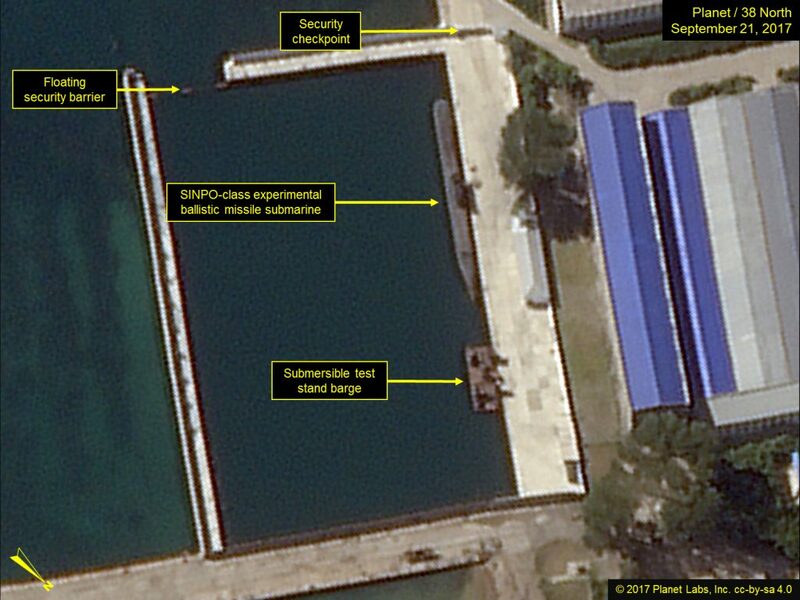 SINPO-class Submarine and test stand barge remain at the secure boat basin. 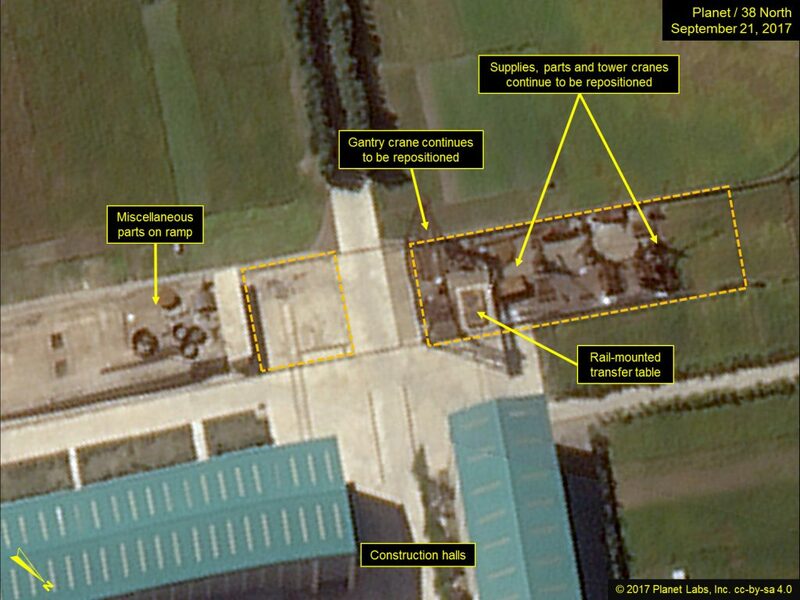 No new activity is noted at the static test stand used for Pukguksong-1 SLBM launch systems verification and pop-up and prototype testing since 2014. At the test stand, the service tower remains in place and there are no indications of the ejection tests reported to have taken place during late-July or early August or of any forthcoming ejection tests. Additional ejection test should, however, be expected in the future for further development of the Pukguksong-1, a potential Pukguksong-3, or other future SLBMs. Figure 3. No new activity observed at the test stand. During this year, the rail-mounted tower and gantry cranes at the construction hall’s parts storage yards continue to be re-positioned, as is the case with the rail-mounted transfer table that is visible in the present image. Additionally, the contents of the storage yards have continued to change. All this activity suggests an ongoing shipbuilding program of some type. While the Sinpo South Shipyard has historically been involved in the construction or repair of submarines, infiltration mother ships, small combatants and hovercraft, it is not apparent what type of shipbuilding program is being pursued. Figure 4. Movement of cranes and parts indicate ongoing shipbuilding program. Figure 5. Cranes working on submerged object near the construction hall. 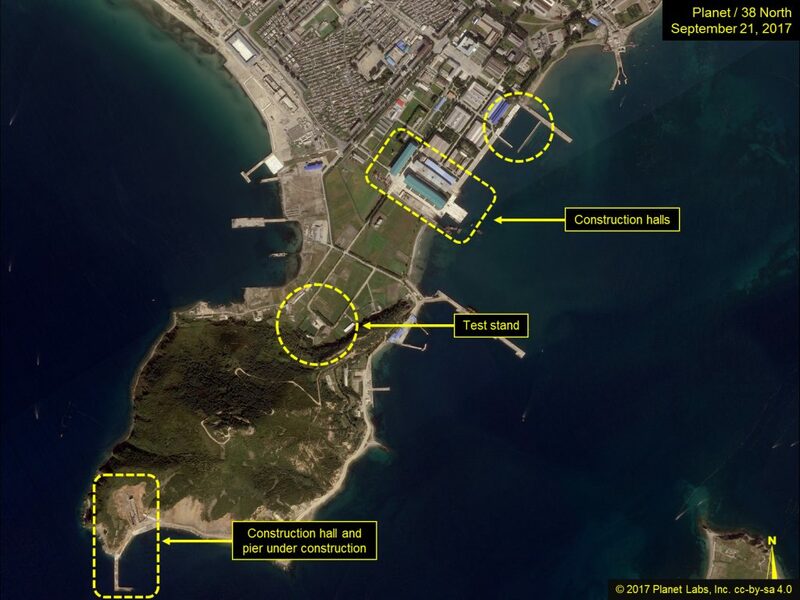 The erection of a new construction or maintenance hall on the southern tip of the Yuktaeso-ri (Sinpo) Peninsula, which began in 2012, has proceeded very slowly through 2016 and 2017. 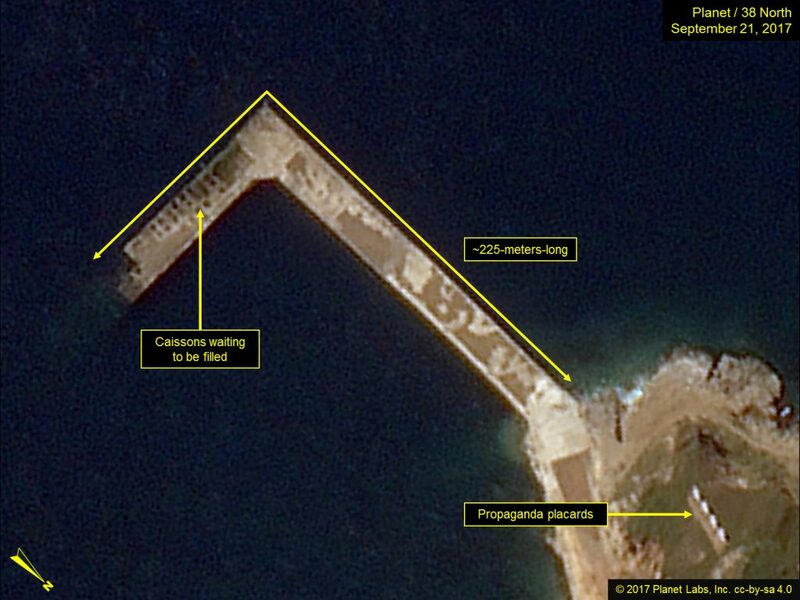 One of the few notable changes has been the modest extension of the L-shaped pier to approximately 225 meters long. The positioning and construction methods of the new hall suggest that when it is completed, it may be covered with earth to provide protection from possible attack. This, in turn, suggests a potential use in support of future submarine operations. Figure 6. Construction work of new construction or maintenance hall continues at slow pace. Figure 7. Continued construction of L-shaped pier. Since 2015 the port and associated facilities at Nopyong-ni, located on the west side of the Yuktaeso-ri Peninsula, have been undergoing a significant modernization and rebuilding program. This program is continuing and progress is observable in the current imagery. Whether this modernization program is related to the future development and deployment of a ballistic missile submarine capability is unknown. Figure 8. 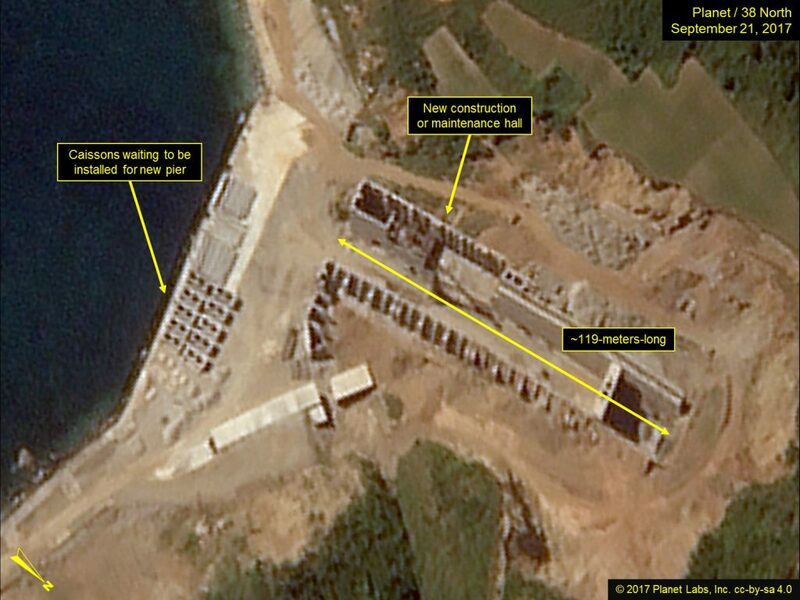 Ongoing activity at port and facilities at Nopyong-ni. Referred to as GORAE-class by South Korean sources. 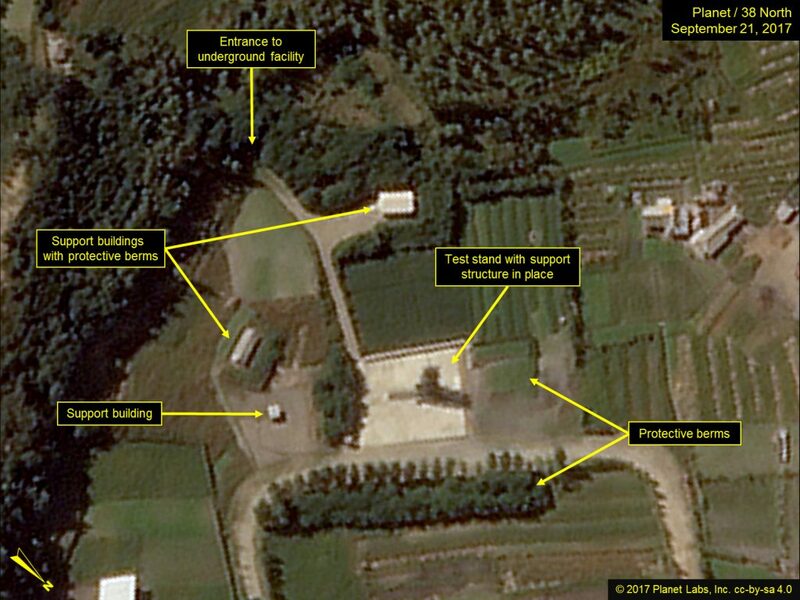 Netting has been employed by North Korea on a number of occasions to conceal activity from both ground and overhead (i.e., satellites, etc.) observation. It has also been used in deception operations. “US detects ‘highly unusual’ North Korean submarine activity,” CNN, July 31, 2017, http://www.cnn.com/2017/07/31/politics/north-korea-ejection-test-submarine-activity/index.html; and “N. Korea conducts SLBM ejection test,” Yonhap, August 1, 2017, http://english.yonhapnews.co.kr/national/2017/08/01/23/0301000000AEN20170801007100315F.html.